Editor’s note: Lee Branstetter is an economics and public policy professor at Carnegie Mellon University. This analysis is being published here in collaboration with EconoFact, a nonpartisan economic publication. The bilateral trade deficits between the United States and a range of countries, including Japan, Korea and, especially, China, fuel President Trump’s claims that these countries compete unfairly at the expense of American workers. We’ve seen this movie before; it echoes claims made in the 1980s when unprecedented trade deficits led members of the Reagan Administration to embrace protectionism more enthusiastically than at any time since Herbert Hoover. Much of America’s rising concern with trade at that time focused on Japan, which seemed to be steadily displacing American firms in industry after industry through “unfair trade.” The Reagan Administration and its successors tried to use American diplomatic pressure to decrease the bilateral trade deficit with Japan using tariffs and quotas on politically sensitive Japanese export industries like cars and motorcycles. The United States imposed a wide range of trade restrictions on Japan in the 1980s. For instance, Voluntary Export Restraints on Japanese autos were equivalent to a tariff rate exceeding 60 percent, according to a widely cited analysis. 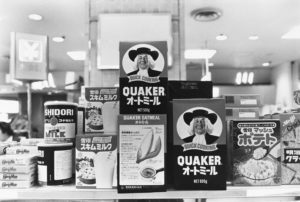 America was able to exert great pressure on Japan at the time because it was both Japan’s major overseas market — by a long shot — and its geopolitical defender against the Soviet Union. There was also no World Trade Organization (WTO) to constrain unilateral moves at the time. Bowing to pressure from the United States, Japanese trade negotiators agreed to a whole constellation of agreements designed to limit exports of steel and cars to the U.S., expand imports from the U.S., and eliminate “barriers” to the success of American firms in the Japanese market. Trade negotiators cooked up a whole alphabet soup of deals – by one count, more than 100 agreements, Memorandums of Understanding, joint announcements, and communiques in the 1980s and early 1990s. There were Voluntary Export Restraints (VERs) on steel and autos, Voluntary Import Expansions (VIEs) like the U.S.-Japan Semiconductor Trade Agreement of 1986, the so-called Market Oriented Sector Specific (MOSS) negotiations that covered five sectors under Reagan, and the Structural Impediments Initiative (SII) begun under Reagan’s successor, George H. W. Bush. In spite of all the trade restrictions, the bilateral trade deficit with Japan did not go away. The bilateral trade deficit remained stubbornly high throughout the 1980s and 1990s and dramatically increased in the late 1990s and 2000s (see chart). The graph illustrates the inefficacy of the “get tough” strategy of the 1980s and early 1990s. Moreover, the reduction in the deficit in the late 2000s was driven by the Great Recession which severely limited people’s ability to buy and consume goods — including imports — not by American trade diplomacy attempting to reduce the deficit by targeting outcomes industry-by-industry. Why did decades of “get tough” trade diplomacy with a vulnerable trading partner fail to shrink the deficit? The answer has to do with the fact that those trade measures did not address the underlying economic conditions that were contributing to higher levels of imports over exports. At issue was the fact that the record peacetime budget deficits during President Reagan’s first term were not matched by an increase in private savings or a drop in private-sector investment. By definition, a country will have a current account deficit if the sum of government budget deficits and private investment are greater than its private savings. When a nation saves less than it invests, the shortfall in savings must be supplied by foreigners who lend to that nation. Much like a household that is spending more than it is earning will buy more than it makes, a nation with higher levels of investment than savings will be buying more from abroad than it sells to other countries. Forces that drive the overall trade deficit, however, do not dictate the particular countries with which imports will exceed exports, or the specific goods and services that will be sources of imbalance. An implication of this is that policies targeted towards limiting imports from a single country or for a particular set of goods would have little effect on the overall deficit. For example, reducing imports of cars from Japan would lower demand for yen, strengthening the dollar against the yen, thus making other Japanese products cheaper in the United States and mitigating the effect on the bilateral trade imbalance. Trying to tamp down the trade deficit through negotiated import restrictions, like those imposed in the 1980s, was like squeezing on a balloon. Motorcycle imports might get squeezed down after Washington slapped a de facto quota on Japanese motorcycle manufacturers, but then stereo imports would just increase. 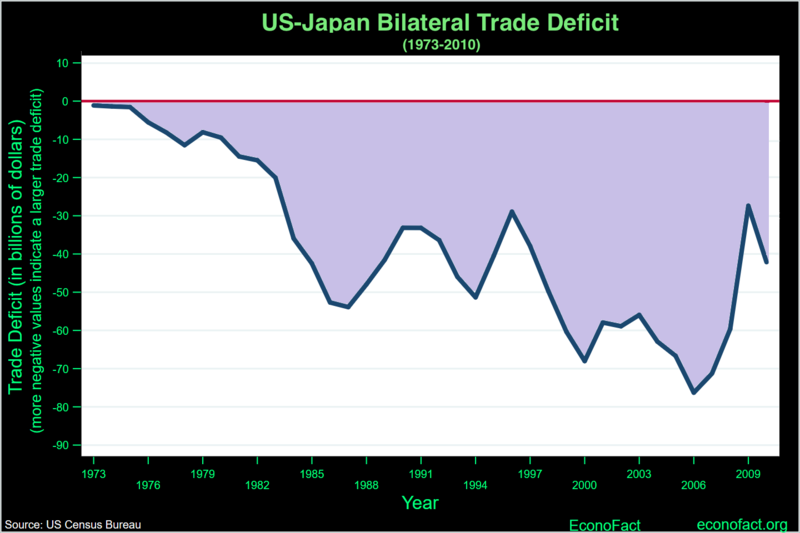 That fact that America’s trade deficit with Japan proved impossible to eliminate with tough talk should give us pause about trying to apply this failed strategy to any of America’s contemporary trading partners. For one thing, America’s leverage in negotiations is lower now than in the 1980s: the end of the Cold War has taken away the geopolitical leverage America once had over nations like Japan; America’s share of our trading partners’ exports has declined sharply; and now, as a member of the WTO, America’s ability to apply unilateral trade sanctions to individual trading partners is limited. But even in the 1980s, the effort to negotiate the trade deficit down through trade policy did not work. And another lesson from the 1980s should also be heeded – a tax bill that adds hundreds of billions in additional deficit spending over the next few years will further raise the trade deficit. Lee Branstetter is a professor of economics and public policy at Carnegie Mellon University.